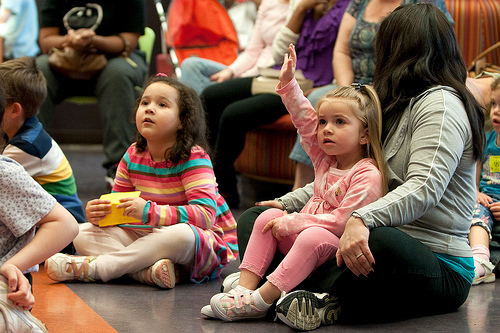 In pre-school here in the U.S., nearly all children are familiar with a teacher’s direction of “sit crisscross applesauce” during story time or music class. We decided to give this expression some Latin flavor and use “mango” instead of “apple”. The name also speaks to how our programs and products “criss-crosses” cultures. So there’s really a double-double meaning. This venture is the result of a partnership between Irania Patterson (Children’s author, Storyteller and Educator) and Ana Lucia Divins (Singer-Songwriter, Multicultural Marketer and Entrepreneur). We met in 2004, after several conversations over Colombian coffee in a local Charlotte, North Carolina coffee shop, we decided to combine our passions and talents to create a very exciting project called: “Criss Cross Mangosauce”. Fred Figueroa, a great friend and talented musician was brought into the project as the Music Director of our very first production… And along came “Criss Cross Mangosauce”. Our first CD was launched in 2007. Since then, we have introduced our music to thousands of educators, children and families across the state. In 2008, we were honored with a grant from the Arts and Science Council (ASC) from their Latino Initiative to implement the initiative: “Criss Cross Mangosauce: Bridging Cultures through Bilingual Music” with the objective of introducing the bilingual and bicultural music of this CD as a unique educational tool for teachers, children and their families.